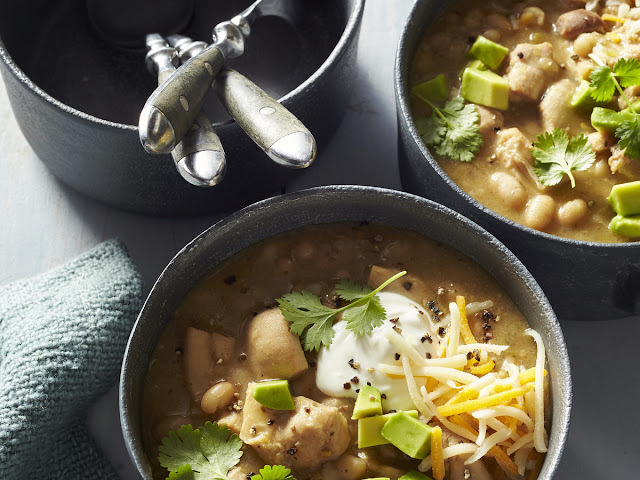 Today's soup recipe is for White Chicken Chili from Southern Living. And, instead of using soaked beans and cooking it in the slow cooker, I'll use unsoaked, still dry beans and my Instant Pot. The Instant Pot makes this recipe possible. I can NEVER remember to soak beans over night plus, not being a morning person, I'm never conscious enough in the morning to start the slow cooker. So, I will come home late this afternoon after spending the day attending multiple Christmas craft fairs (Yay!) quickly chop the onion, garlic & chicken and toss it into the Instant Pot with a bit of olive oil for a few minutes. While that's sauteing, I'll dig the rest of the ingredients out of the pantry, dump them into the Instant Pot, set it on high pressure for 30 minutes then do a slow release. And if I serve avocado with it, the avocado will be in the form of guacamole, not just diced avocado. As much as I love garlicky, mashed up avocado (guacamole,) I can not tolerate the texture of sliced (or diced) avocado. Ugh! But no matter how you like your avocado, you can find the white chicken chili recipe here. Now that sounds DELICIOUS!!! Enjoy.